Boris Gryzlov: "Certain progress has been made in each of the groups." Boris Gryzlov, Russian Representative to the Contact Group for Ukraine, permanent member of the Russian Security Council, feels cautiously optimistic about prospects of the Donbass peace process within the Minsk process framework. "I would like to call your attention to the fact that we are not seeing the current situation as a stalemate. There are lots of ways and breakthrough options. It is my task to explain this to the parties of the process. But you are right: there are forces interested in the impasse. And worse yet, some would like to avoid responsible actions in the implementation of the Minsk agreements, and it is advantageous to them to present the situation as a stalemate. Still, I have no doubt that we can make significant progress in the fulfillment of the Minsk agreements. This is proven [through] the meetings I have had in Kyiv and Minsk," Gryzlov told Kommersant in an interview published on the edition's website. "Certain progress has been made in each of the groups," he said. "For instance, prisoner exchanges continue, although not in the 'all for all' format but in other formats. Demining problems and humanitarian issues are being resolved, and even the political group, which gets much attention, has made some progress," Gryzlov said. He strongly objected to the stalling of the Minsk agreements by artificial means. "Russian participants in the Contact Group and the subgroups are processing plenty of details, so that no one can hide behind them. Everyone must remember about liability for stalling solutions before the national administrations and people suffering from the ongoing humanitarian catastrophe," the Russian envoy said. "Every provision of the Package of Measures needs to be fulfilled, and, if this requires additional time, all of the sides need to take maximum efforts for fulfilling the agreements," he said. "The Contact Group will hold regular meetings. The next [meeting] is scheduled for January 20. Its agenda has already been planned. Yet, the scope of work is huge and it is not only limited to these matters," he said. As to the media claims of the format changing to the so-called Minsk III, Gryzlov said that Russia adhered to the Minsk Package of Measures. "The Russian Federation sticks to the positions and measures declared in Minsk on February 12, 2015. 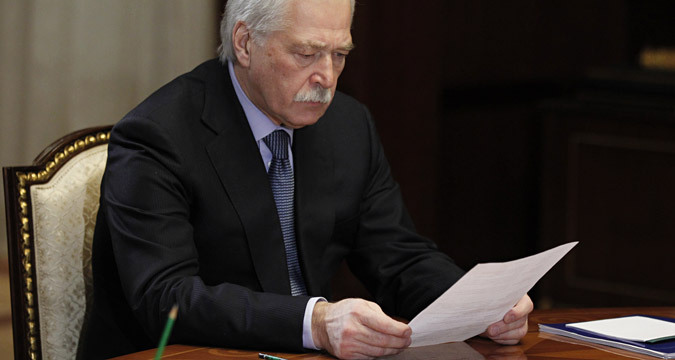 We have no grounds to speak about any other agreements," Gryzlov said. Kiev and Donbass are the parties to the conflict in eastern Ukraine, he said. "According to the Minsk agreements signed by Ukraine, amendments to the Ukrainian constitution in the field of decentralization and the law on elections need to be coordinated with Donbass," the envoy said. "There are only two sides: Donbass and Kiev. The Contact Group may support the determination of specific deadlines for the fulfillment of the provisions of the Package of Measures. Yet, it is important to remember that Ukraine has not coordinated with Donbas and has not passed amendments to the constitution and the special status law, without which the complete implementation of the rest of the Minsk Package of Agreements would be impossible," Gryzlov said. Local elections in Donbass are an important item on the Contact Group's agenda, he said. "I think we have a good foundation for negotiations - the Package of Measures for the Implementation of the Minsk Agreements, the first anniversary of which will be observed on February 12. Indeed, all signatories to these agreements want to achieve results. It is important that these results fully meet the Package of Measures, the letter and the spirit of the Minsk agreements. Presently, an important question of the Contact Group and the political subgroup is the law on elections [in the self-proclaimed Donetsk and Luhansk people's republics]. It is also necessary to implement an agreement reached at the January 13 meeting - the exchange of prisoners of war," the envoy said. Gryzlov called constructive the attitude to the elections issue exhibited by the Donbass representatives to the Contact Group. What can we expect from Russian foreign policy in 2016? "The Contact Group will keep on working in this area. Representatives of the southeastern regions are constructive. It is a task of the Contact Group to be a platform for reconciliation of all positions, fulfillment with international demands, and, in the end, strict compliance with the letter and the spirit of the Minsk agreements," he said. "There is no alternative to the Minsk agreements, and the decision to carry on the Minsk format in 2016 has been quite logical after it became clear that provisions of the agreements would not be fulfilled in 2015," he said. Gryzlov hopes that Kiev will deal with provocative fire coming from Ukrainian positions along the Donbass contact line amid the truce. "I think that commands sent from the top may not reach the bottom. According to Donbass representatives, provocative fire sometimes comes from the positions of so-called volunteer battalions and, less often, from the positions of the Ukrainian Armed Forces. I am sure that this information should be thoroughly examined by the Ukrainian side," he said.